Yesterday I hosted my best friends baby shower! A chance for all her special ladies to get together and shower Baby Alger with love, to play silly games and spoil Mummy and Baby! I thought I’d just show you some of the things I planned and made. You never know when it might be your turn to host a party! Guess the size of Rachel’s bump – we used a ball of wool (you can also use ribbon) to guess the size of the bump. 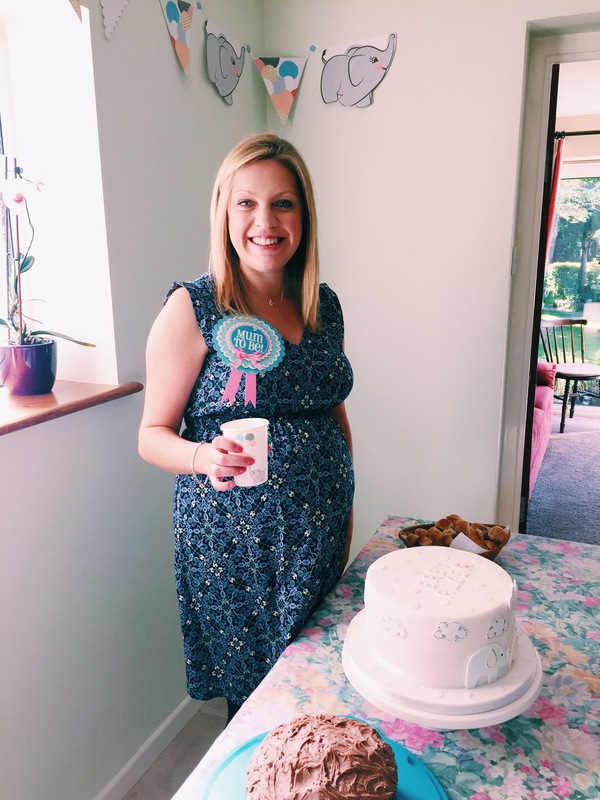 A fun game – just be careful you don’t offend the Mum-To-Be!! Guess the amount of sweets in the baby bottle – I filled an extra large baby bottle with jelly babies and people had to guess how many sweets were inside. Simple game and the winner gets to keep the baby bottle filed sweets! 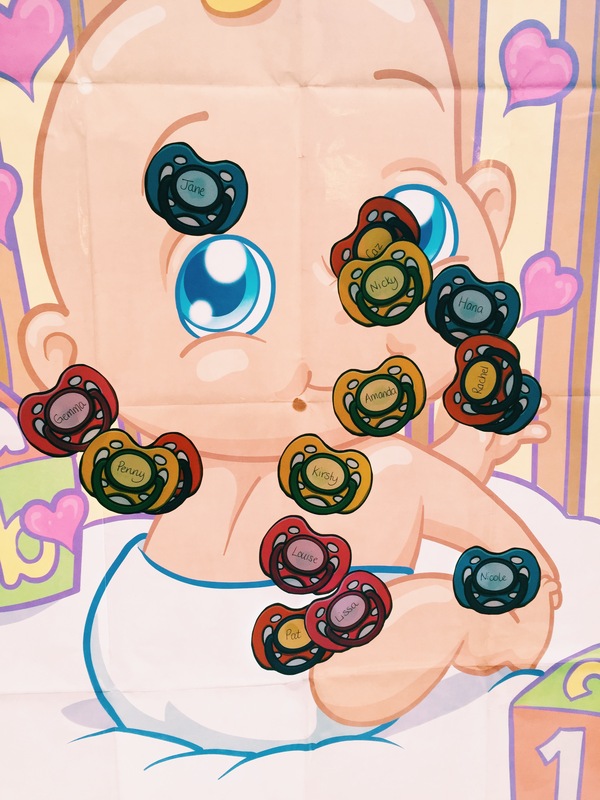 Guess the baby food flavour – what a game!! As I took the lids of the jars it absolutely stunk! But what a laugh the game is. I labeled 8 baby food jars 1-8 and gave out forms. Each guest tasted a little from each jar and wrote down which flavour they thought it was. It was quite hard. But Jenni got every single one right. Pretty impressive! Guess Baby Alger’s birthday – I printed out a calendar and I bought a baby footprint stamp. Guests placed a stamp on the date they think Baby Alger will be born and signed their name underneath. We won’t know the winner of that one just yet! I had a beautiful cake made by the brilliant Emily Jane Cakes which tasted and looked amazing and tasted incredible. A few years ago Rachel and I attended a cake decorating class with Emily Jane it was amazing. I have also booked her to make our wedding cake – that’s how fab she is! Then I made my masterpiece – My Fruit Bowl baby cot. A watermelon carved into a cot filled with fruit and to complete the cot an orange with grapes for eyes and a dummy to make the babies head. I also got some sandwiches from Waitrose Entertaining and some of the guests made/bought some bits. A yummy chocolate cake, incredible scones, sausage rolls, brownies, quiche, cupcakes and crisps. I also made some little bags up of popcorn and got my talented friend Helen to make the tags which read ‘Rachel’s Ready To Pop’, to hand out as the quests left as a little favour. Helen also made me a beautiful hand painted print of Rachel and Simon holding an umbrella with the wording Baby Alger – Showered with Love and then the date of the baby shower, which I then got everyone to put their finger print on the top, in blue ink, to look like the rain coming down. It made a beautiful little keep sake. Then came the presents. Rachel and Baby Alger are thoroughly spoilt with the gifts they got. ← Gyming it like a Pro!